NASA astronaut Buzz Aldrin stands on the moon during the Apollo 11 mission in July 1969. President Barack Obama evoked the space race of the 1960s as a model for the future of the United States in his State of the Union address on Tuesday evening (Jan. 12). Speaking before a joint session of Congress for the eighth and final time of his administration, Obama raised the nation's competition with the former Soviet Union as he questioned, "How do we reignite that spirit of innovation to meet our biggest challenges?" "We built a space program almost overnight, and 12 years later, we were walking on the moon," he said. The Soviet Union kicked off the space race on Oct. 4, 1957 with the launch of Sputnik, the Earth's first man-made satellite. Almost four months later, the United States followed suit with its own satellite, Explorer 1, but still trailed the Russians as it lost the race to put the first man and woman into space. 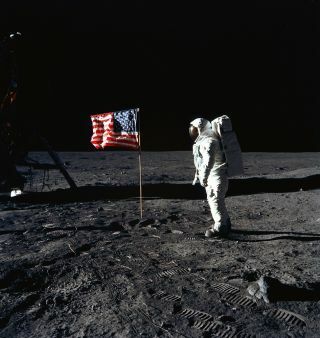 Ultimately, the U.S. declared victory by achieving President John F. Kennedy's goal of "landing a man on the moon and returning him safely to the Earth." On July 20, 1969, NASA astronaut Neil Armstrong became the first human to step onto the lunar surface. Obama on Tuesday said that the same "spirit of discovery" that led to the moon landings "is in our DNA." The President cited the late Sally Ride, the first American woman in space, among a group of inventors and scientists who led the country through its earlier scientific successes. He then tapped that spirit to propose a new goal: curing cancer. "But we can do so much more. Last year, Vice President [Joseph] Biden said that with a new moonshot, America can cure cancer," Obama said. "Tonight, I'm announcing a new national effort to get it done." "And because he's gone to the mat for all of us, on so many issues over the past 40 years, I'm putting Joe in charge of 'Mission Control,'" the President said. Biden lost his son, Beau, to brain cancer at age 46 in May 2015. "For the loved ones we've all lost, for the family we can still save, let's make America the country that cures cancer once and for all," Obama declared. Tuesday's State of the Union was not the first time Obama cited the space program as the best of what the nation had to offer. For last year's address, First Lady Michelle Obama invited NASA astronaut Scott Kelly to attend the speech. Kelly was just two months from departing on a nearly year-long mission aboard the International Space Station, where he was on Tuesday night with just 50 days remaining before he returns to Earth. "Window seat at #SOTU [State of the Union]," Kelly wrote on Twitter, attaching a photo of the American flag unfurled near the windows of the space station's cupola. "Last year [Obama] told me 'Instagram it!' 636 #YearInSpace photos. How am I doing Mr. President?" "So proud of you, Scott," President Obama replied a couple of hours before taking the podium. "See you when you get back!" Robert Z. Pearlman is a contributing writer and the editor of collectSPACE.com, a Space.com partner site and the leading space history-focused news publication. Follow collectSPACE.com on Facebook and on Twitter at @collectSPACE. Follow us @Spacedotcom, Facebook and Google+. Original article on Space.com. Portugal Just Launched a National Space Agency!